A. Fold tape in half. Use the notches to assure an even fold. Use end of striker pin to crease sharply. B. 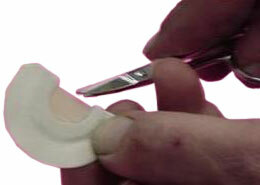 Remove center area of pre-cut tape and discard. 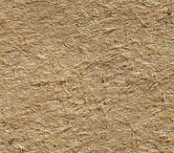 C. Pull backing from tape. D. Place the tape in the crease of the tape applicator card (Adhesive side facing up). E. Align the aluminum frame into the tape, being careful to contact only the edge of the frame to the tape crease, and then close the applicator card. Since this is the most delicate operation, we have supplied you with an extra tape to practice with. If there is a slight mismatch in the tape around the frame, it can be manipulated into place with your finger tips. F. Trim the tape to fit your mouth comfortably. Note: When placing the frame into your mouth, the tab should be down and the widest reed should be up. G. Using your scissors, cut the top reed only to make one of the configurations shown below to achieve the desired sound. You may want to experiment with this or not any cuts in it at all. A clearer tone can be achieve without any cuts. Click here to learn about how to make calls with your Call "Purr"fect Turkey Call.